Kick off your visit on the 25th (Thu): contemplate the long history of Mission San Jose, admire the architecture and history at Mission San Juan, and then get to know the fascinating history of La Villita Historic Arts Village. Get ready for a full day of sightseeing on the 26th (Fri): get engrossed in the history at The Alamo, get a taste of the local shopping with The San Antonio River Walk, then take in the architecture and atmosphere at San Fernando De Bexar Cathedral, and finally get to know the fascinating history of King William Historic District. For traveler tips, where to stay, other places to visit, and tourist information, use the San Antonio trip website . Houston to San Antonio is an approximately 3-hour bus ride. You can also drive; or fly. April in San Antonio sees daily highs of 82°F and lows of 60°F at night. Cap off your sightseeing on the 26th (Fri) early enough to go by car to Fredericksburg. Start off your visit on the 27th (Sat): brush up on your military savvy at National Museum of the Pacific War, learn about winemaking at Grape Creek Vineyards on Main, then sample the fine beverages at Garrison Brothers Distillery, and finally learn about winemaking at Grape Creek Vineyards Fredericksburg. For maps, ratings, more things to do, and tourist information, go to the Fredericksburg trip itinerary site . Drive from San Antonio to Fredericksburg in 1.5 hours. Alternatively, you can take a bus. Plan for slightly colder temperatures traveling from San Antonio in April, with highs in Fredericksburg at 76°F and lows at 53°F. Finish your sightseeing early on the 27th (Sat) to allow enough time to drive to Austin. 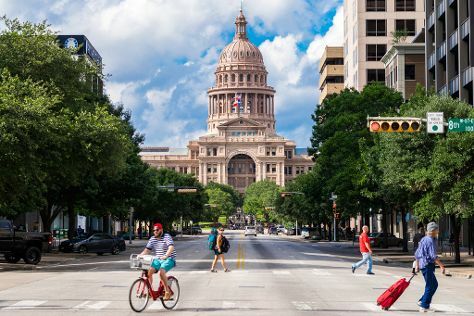 On the 28th (Sun), take a stroll through South Congress Avenue, hike along Lady Bird Lake Hike-and-Bike Trail, and then ponder the world of politics at Texas State Capitol. For photos, maps, other places to visit, and more tourist information, you can read our Austin trip planner. Traveling by car from Fredericksburg to Austin takes 2 hours. Alternatively, you can take a bus; or do a combination of bus and train. Traveling from Fredericksburg in April, Austin is a bit warmer at night with lows of 59°F. Cap off your sightseeing on the 28th (Sun) early enough to go by car back home.